It is unusual to be haunted and refreshed at once, but Graham Waterhouse's newly released trio strikes the ear as original in many aspects. The work is based on a short theme of only ten bars laying down a pattern of tritones, augmented fourths and diminished octaves that presses on throughout, forever fleeting and unresolved… The composer's purposeful use of ambiguous, shifting harmonies and overlapping unisons sets these contrasts in miniature apart from much that is being written today, conveying the uncertainty of our times. de: Jede Variation bringt - ähnlich wie ein Pantomime oder ein Ballett-Tänzer - eine andere Bewegung oder Geste zum Ausdruck. 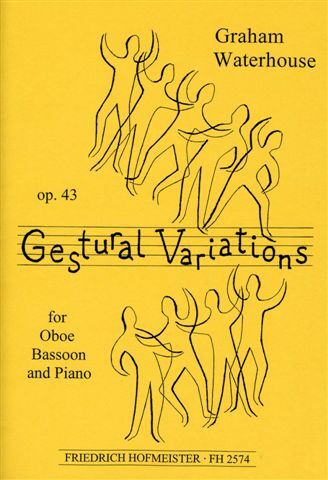 Did you know … that the flute arrangement of the trio composition Gestural Variations was premiered in Munich by the composer, Graham Waterhouse, and two other composers?